There are a few ways to track PDF Downloads in Google Tag Manager. However, for this example, I would like to use a click listener method. We will generate an event each time someone clicks a PDF link. Tracking the actual download isn’t necessary because many people will simply view the PDF file in the browser. Click the link the below to see how a PDF is displayed the browser. 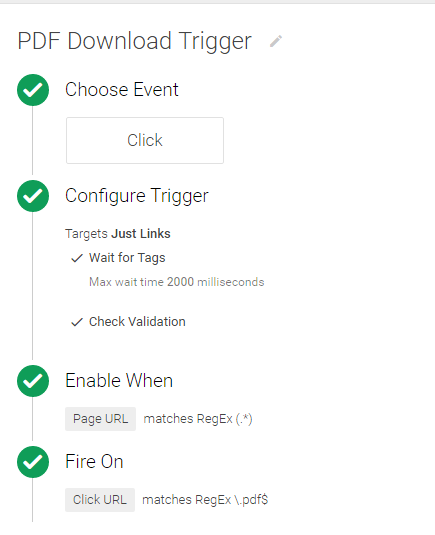 First you will need to Open up Google Tag Manager and create a trigger and tag. 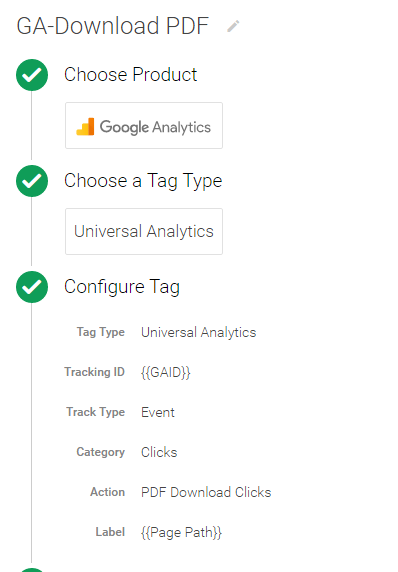 We will use Google Analytics as our tracking platform. However, please feel free to use others. Lets get started with the Tag creation. For Label Choose Page Path or Page URL to know how users reach the pdf. For the moment, leave Fire On blank, we will create a trigger to add to the tag. The next step is to create a trigger that will tell the tag to fire each time our PDF download link is clicked. Under Enable When, you want to enable this on all pages by choosing Page URL contains (. *) If you want to track on a specific URL please indicate. For Fire On, chose the Click URL, since you know this is a PDF, we can use the \.pdf$ to indicate that we only want to track PDFs. Attach the Trigger to the Tag. Open up your previously created PDF download tag, under Fire ON, choose Click. Add the trigger that you previously made to the Tag and Save. See if the Tag is fire in the Debug Console.